The best VPNs for torrenting are the ones with privacy and security in mind. Plus they get you the speeds you need to share those large files! We’ve tested all the VPNs in-house so you don’t have to. Find out which VPN is for you. In this day and age, there are millions of us who torrent and share files with our peers. Whether it’s for sharing simple files or to download movies and TV shows, the numbers don’t lie. 39% of computer software used around the world was pirated in 2016, according to BSA Global Software Survey. 84% of digital content in Spain is consumed illegally. Over 1 million downloads for Game of Thrones in just half a day (at its height, over 300,000 BitTorrent users were actively sharing the file at the same time). These numbers are astounding, but it hints at something dangerous: these are public figures that media companies, license holders and governments have access to – numbers they will use against you. The main reason for you to get a VPN for torrenting is simple: you want to protect yourself. You don’t want your ISP to know exactly what content it is that you’re torrenting, do you? If you torrent without a VPN, your IP is publicly shown. Meaning, the entire world will know what you’re downloading. Now that we’re all on the same page, let’s just jump right into recommendations of the best VPNs for torrenting. Not all VPNs are created equal, we round up the best ones we’ve used, and also explain why we believe these are the best for safer torrenting. Zero Leaks – your information isn’t revealed to anyone. No Logging – your information isn’t recorded by anyone. Outside of “Eyes” – your information isn’t shared with anyone. Fast Speeds – your speed isn’t throttled or limited. Legitimate Company – established businesses with a track record. Strong Protection – highest grade encryption for your safety and kill switch in case your connection with the VPN server isn’t stable. So here are the VPNs that meet the criteria. ExpressVPN was as an easy pick for us to be the best “go-to” VPN for 2018. This British Virgin Islands-based VPN provider has been making rounds on the internet for its good reputation as a VPN provider. 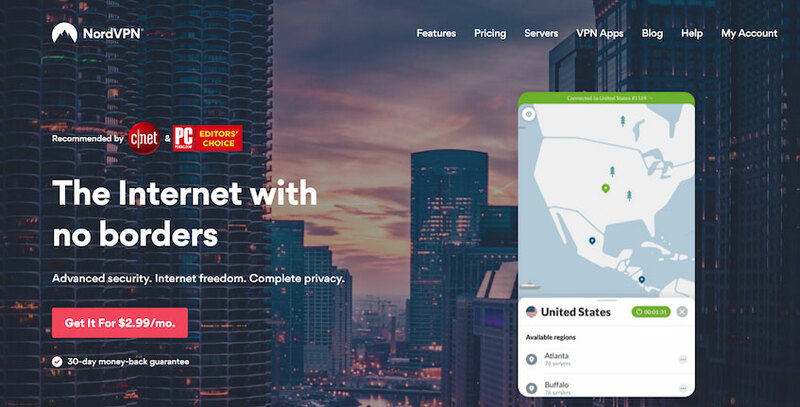 It’s an easy favorite pick by a lot of VPN users since ExpressVPN meets almost all of the standards being set upon VPNs. ExpressVPN utilizes the highest industry standard encryption and offers multiple security protocol options, including OpenVPN. As for logs, ExpressVPN is a safe option as it does not keep logs nor does it reach out to third-party services which can snoop on their data. More than that, ExpressVPN goes through very minimal loss in download speeds, which allows for the fastest file sharing through a VPN. Overall, ExpressVPN would provide you with everything you need for a fast and reliable torrenting experience. For a more detailed review, take a look at our in-depth guide to ExpressVPN. Editor’s Note: Looking for a free VPN for torrenting? You’re asking for trouble. Free VPNs have strict bandwidth caps, are not secure for any “illicit” activities (your identity will be revealed). You can try ExpressVPN for 30 days no risk. NordVPN operates in Panama, outside of the government networks that snoop on your data, and as a result, your torrenting activity is safe from prying eyes. The industry standard 256-bit encryption is also utilized. To this day it still uncracked by brute forcing methods due to the sheer computing power required to do it. NordVPN is also one of the very few VPN providers that offer SOCKS5 proxies, which enables you to download torrents faster. Going through a SOCKS5 proxy still provides you anonymity albeit just with less encryption. If the file you’re downloading through BitTorrent isn’t considered illegal, SOCKS5 presents itself as the fastest, secure option for torrenting. NordVPN also optimized hundreds of its 5,000+ servers for torrenting with unlimited bandwidth capacity. Download speeds would never be a problem with NordVPN. The price for NordVPN start at $3.99 per month, also making it a real no-brainer. If you’re interested, we did a step-by-step review of NordVPN so you have a better idea of all its features. Editor’s Note: Free VPNs are not safe at all. On top of that, you will only have 500MB per day, which you can’t do anything with. Your torrenting activities will be publicly made. You can try NordVPN for 30 days no risk. Mullvad has its reputation for taking VPN anonymity to the next level. The signup process is unique; you’re given a randomly generated account number and that’s it. Mullvad doesn’t care about knowing who you are or where you’re from – that is true anonymity. Mullvad is one of the best options for torrenting since the download speeds are really fast, even with the high level of encryption. This allows you to download torrent files securely at the least possible time. If there’s any drawback to Mullvad, it’s their customer support. They are simply not that responsive. Overall, the great things about Mullvad for torrenting easily outweigh its weakness; there really is no reason for you not to try it out. But if you’re still not convinced, here’s our detailed review of Mullvad. When it comes to ease of use in VPNs, CyberGhost is one that immediately comes to mind. The level of intuitiveness in the app translates well into their torrenting features. CyberGhost VPN is also based in Romania, which makes it bulletproof against data retention laws. With VPN providers hesitating to take stances on torrenting, there are still one-offs like CyberGhost that makes it clear for subscribers. As seen in the main menu of CyberGhost, you can access their torrenting servers right off the bat. One could argue that these dedicated torrenting servers allow for the most anonymity since more users share the IP addresses. When it comes to speeds, CyberGhost is far from the fastest VPNs for torrenting. This is because CyberGhost does not allow port forwarding on their servers. Some torrent clients are configurable for port forwarding to allow for faster speeds, but this usually opens the connection to vulnerabilities. Despite speeds, we still see CyberGhost as a strong torrenting VPN, due to its security features and easy-to-use app. Of course, there’s more to why we were impressed with CyberGhost. Read our review here to find out more. Editor’s Note: Always use a premium VPN for torrenting. You should look out for zero logs and zero leaks with a high bandwidth cap. CyberGhost checks those plus there’s a free trial for 24 hours. If you’re serious about security, a free VPN is always out of the options. Windscribe VPN is the one free VPN we have on the list. They have a free VPN package that is the same as their premium VPN – they just limit your bandwidth. Windscribe isn’t the best VPN… but if we consider the costs, this VPN is still the best you can get for torrenting. Despite being free, Windscribe’s security feature is still at par with industry standards. It’s not one of those free VPNs that take advantage of you by gathering so much data. The only data Windscribe collects is the amount of bandwidth you consume to make sure you stay under the limit, and that’s harmless enough. For torrenting, Windscribe allows up to 10 GB of data to be downloaded per month, which really isn’t so bad and way better than nothing. Upgrading to the paid service simply takes away the bandwidth cap. Do note that Windscribe is based in Canada, which is a member of the Five Eyes Alliance. But if you want to bet Windscribe to not log your activity, you have a decent torrenting VPN that you can get for free. For more details on Windscribe’s other features, read our in-depth review! Editor’s Note: Try out Windscribe but don’t upgrade. We generally don’t trust free plans! The data cap seems high enough along with good business policies. However, if you are seriously considering a safe VPN to torrent with, we recommend NordVPN or ExpressVPN (both come with 30-day refunds). Maybe you’d like to educate yourself further on the matter and do your own research? Keep reading to learn how you can protect yourself. A VPN’s security features are the reasons why you stay protected. This is why it’s imperative that your VPN provider uses industry-standard levels of encryption and security protocols to keep your identity hidden. Poor security features offered by substandard VPN providers (usually free VPNs) are susceptible to DNS leaks which can easily expose your identity. A kill switch feature also helps out in preventing your VPN from temporarily exposing your identity in cases of interrupted connections. Dedicated servers are often optimized for a better file sharing experience. Meaning, you will get faster download and upload speeds. On top of this, the more users are sharing the same IP, it is more difficult to trace a specific activity back to you. One key factor is making sure they do not log your activities since this is one way to trace your activities back to you. Here’s another reason why you should avoid free VPNs. They have bandwidth limits. Not only that but they also usually suffer from slow speeds due to either network congestion or unoptimized servers. Before subscribing to a VPN service, you have to check whether your VPN allows for high bandwidth capacity. Some keywords to look for is gigabit connection. This would ensure that your download speeds are maintained at the fastest possible rate. Make sure you also check for any bandwidth caps. Always look for a VPN with strict no-logs policy. A VPN that logs or tracks your online activity defeats the purpose of using one. More than that, logs are admissible evidence in case you face legal action for torrenting or copyright infringement. But they are usually in the “Eyes” jurisdiction. Meaning your data can be handed over to the government and shared among the 5, 9 and 14 Alliance members. Of course, if the VPN has a no log policy, the risk is even further reduced. Which Security Protocol Should Be Used for Torrenting? With VPNs offering various security protocols in their VPN service, it’s possible for you to be confused. There’s a consensus that OpenVPN is the go-to option. OpenVPN is open-source and security experts contribute to the project to keep it secured. OpenVPN also seams in well with AES encryption, which is pretty much the standard for VPN providers nowadays. When it comes to security, OpenVPN remains as the people’s choice. Should I Start Using a VPN for Torrenting? VPNs, in general, offer you great security when you’re online. VPNs allow you to reclaim your privacy rights and have access to a secure, open Internet. For torrenting especially, you are ensuring that there will be no legal action against you in case you decide to torrent copyrighted material. The act of torrenting in itself is not illegal. It only becomes illegal when you start using it to download and share copyrighted material. Some countries, as a preventive measure, shut down torrenting websites by having ISPs block them. Fines are also being imposed upon those who are caught downloading copyrighted material. In some cases, legal action is used to set an extreme precedence to scare and deter people from torrenting. There’s a case-to-case basis for countries on how they see torrenting and it’s best to check your local laws before partaking in the network. As mentioned earlier, a BitTorrent network is open and can be infiltrated by persons with malicious intent. So the possibility of downloading infected files is a likely risk. If you download any copyrighted material, the possibility of authorities catching you isn’t off the table. Can You Get Caught Torrenting? When seeding or leeching torrents, it’s very easy to spot the IP addresses that are participating. That alone exposes your identity. Your ISP can also see your activity (and often records all your Internet usage). A red flag can be triggered the moment you start downloading a file through the network. Let’s remember, without a VPN, your IP address is available to the public along with all your history of downloaded files. As mentioned earlier, there is a case-to-case basis in torrenting regulations among states. Some countries like South Korea throttle down the speeds of your internet connection by as much as 74% of your speed as a penalty for torrenting. Other countries like the UK would go to the extent of putting you to jail, as already done in a landmark case in 2016. In other cases, penalties for those that get caught amount to thousands of dollars. In one extreme case, a Minnesota woman was fined $220,000 after illegally downloading 24 songs. Yes, you read that right – the federal court ruled and set the damages at $220,000. How Can I Protect My Torrenting Activity? First, use a VPN. VPNs grant you anonymity by assigning you a different IP address from somewhere else in the world. Second, make sure the VPN does not keep logs of your IP or your activity. Third, get a VPN that is outside any Alliance jurisdiction. In addition, some VPN services even have integrated virus and malware scanners that would alert you when they detect something. Putting a value to your safety and privacy is difficult. But you can do the math. A VPN is an all-in-one solution that protects you at a low cost of somewhere around $5-8 per month. Should I Even Use a VPN?